Perro Aguayo, Don Pedro Damian Aguayo, is a living legend and perhaps the biggest non-masked start in the history of lucha libre (along with Ray Mendoza.) He left an indelible mark on every fan who him in the ring. His slogan was "El Cán de Nochistlán" (Nochistlan's dog), and ironically, his name was the product of an error when he was announced the first time. 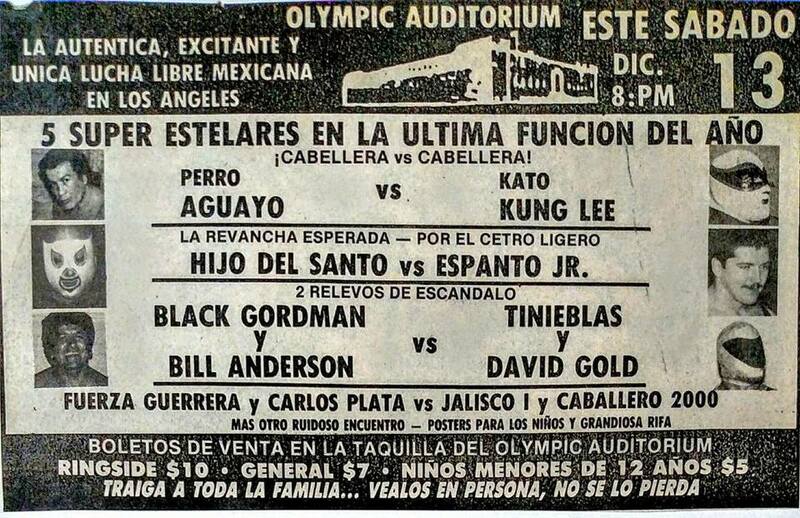 He was to be announced under his real name of Pedro Aguayo, but the d was changed to an r. Aguayo was angry about this mix up at first, but the unique name and character helped him become recognized as one of the lucha libre legends of the 70s. Born in El Rancho Virgen de Nochistlan in Zacatecas, Pedro Aguayo had a hard childhood. He was 5 years old when he began working to support himself, and only went as thru the second grade in school. When he was ten, he moved to Mexico City and worked as a shoemaker, baker, and boxer. One day, Pedro met a luchador who convinced him he could do better in lucha than boxing. The first day of lucha libre training was unforgettable rough, and he was laid up in bed for days. Pedro stuck out the training, and continuing training in the lucha gym - Gloria. At the gym, he met Ray Mendoza and two of his sons, the future Villano I & Villano II. Pedro later met Diablo Velsaco, who trained him and prepared him for his debut. His first match was on May 10th, 1970 in Sayula. Perro had many victories in his career, including winning the WWF World Light Heavyweight Championship while part of UWA, and much success in Japan. Still, Perro wanted the greatest trophy in lucha libre, the one thing every wrestler most wanted - El Santo's mask. Perro appeared in a couple of movies: "Los Justicieros" and "El Angel del Silencio". The second movie was filmed in the middle 70s, and Perro killed the title character (played by Rogelio Guerra) in the movie. Perro's career ended (for the most part) in an memoral way. In 2001, Perro was winding down his career, on an extended retirement tour, and due to have neck surgery due to a life in the ring. The feud with the Los Hermanos Dinamitas was still going strong, Perro faced the younger Dinamita, Universo 2000, in a hair match at Arena Mexico. Universo won the match by using his Black Hammer martinete, and Perro concluded his career with his hair being cut off as he was unconscious and being strapped to a gurney. As all expected, Perro Aguayo eventually did return to the ring for revenge, teaming with his son Perro Aguayo Jr. to beat Cien Caras and Mascara Ano 2000 for their hairs, and helping Junior beat Universo 2000 for his hair. Perro works about once or twice a year, but has peacefully retired as an every day wrestler. 87/12/20 hair Perro Aguayo Sangre Chicana Plaza de Toros Monumental - Monterrey, N.L. 88/04/?? hair Perro Aguayo Gran Markus Plaza de Toros Monumental - Monterrey, N.L. 91/08/01 mask (2) Perro Aguayo Stuka Plaza de Toros Monumental - Monterrey, N.L. 91/08/08 hair Perro Aguayo Stuka Plaza de Toros Monumental - Monterrey, N.L. This page was last edited on 17 December 2018, at 17:27.